I’m on a bit of a lamb kick at the moment, so I tried this very interesting Malaysian lamb dish last night. Malaysian cuisine is influenced by cuisines from around the world, but it is particularly influenced by its Malay, Chinese and Indian ethnic groups. 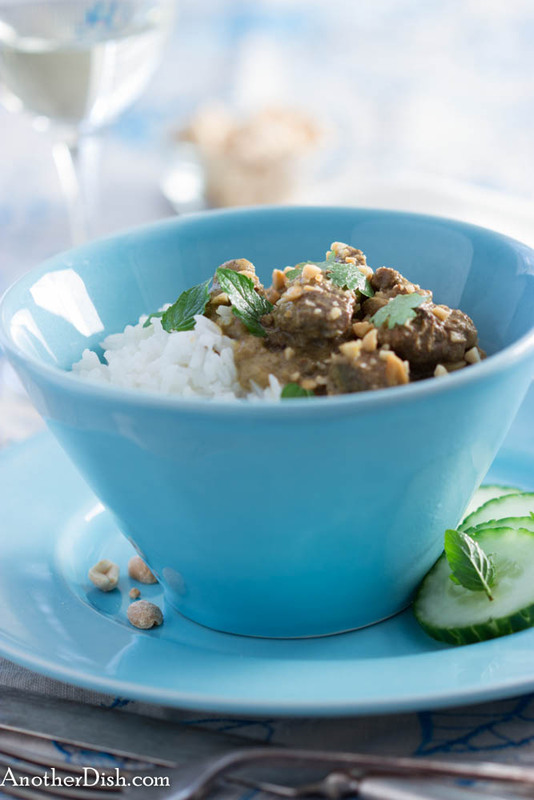 This dish is a delicious Malaysian spin on Indian Lamb Korma. The unique balance of spices and herbs, and the use of ghee are what make this dish! I hope you’ll try it! In a small food processor (or mortar and pestle), grind ginger, garlic and chilies to a fine paste. Stir in the garam masala, ground coriander, cumin and turmeric. In a medium bowl, combine the lamb cubes and the garlic mixture well, ensuring that every cube is coated. Cover and let stand in the refrigerator for one hour. Heat ghee in a Dutch oven over medium-high heat. Add the onions and sugar, and cook until caramelized, about 20 minutes. Stir in the cardamom pods, cinnamon stick and lamb with its marinade. Brown the lamb, stirring for 4 minutes. Stir in the coconut milk and bring mixture to a boil. Reduce heat to low, cover and simmer gently until meat is tender, about 1 hour. Season to taste with additional salt and black pepper. Serve over steamed jasmine rice. Garnish each serving with the chopped peanuts, cilantro and mint. 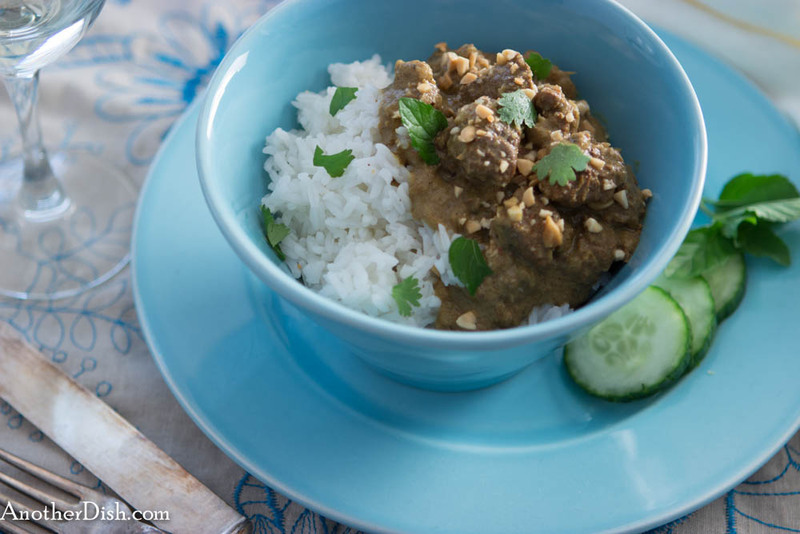 This entry was posted in Lamb, Main Dishes, Malaysian and tagged Chilies, Cooking, Curry, Food, Food Photography, Foodie, Jasmine Rice, Malaysian Food, Recipes, Southeast Asian Food, Spicy on July 21, 2013 by AnotherDish. Hi Cocino Thai, thanks for the great comment! Thanks, Hari. I find the “hybrid” cultures of the Malay Peninsula and Indonesia very fascinating, and they add to the wonderful cuisines! Again, let me know what you think of this one when you get around to trying it. Thanks, I hope you’ll try it sometime!